We’d love your help. Let us know what’s wrong with this preview of The Answer by Allan Pease. When disaster struck inspirational gurus Allan and Barbara Pease’s lives, they turned to science to learn how to turn failure into ultimate success. They discovered new studies of the brain that show how you can reprogram your mindset, enabling you to see opportunities, not difficulties. In The Answer the Peases share their experiences with honesty and humour and show you how to make your life what you want it to be. To ask other readers questions about The Answer, please sign up. If you have read self-help books previously you will probably think there is nothing new in this one. What I did find in this one over others though, is that it goes on to explain how the brain processes the information to make it happen for you. I have read all about visualisation techniques before and have never been able to get them to work, the bit that I was missing was the having to write it down first and then visualise it to let the brain work out how to achieve it. If you have never read If you have read self-help books previously you will probably think there is nothing new in this one. What I did find in this one over others though, is that it goes on to explain how the brain processes the information to make it happen for you. I have read all about visualisation techniques before and have never been able to get them to work, the bit that I was missing was the having to write it down first and then visualise it to let the brain work out how to achieve it. If you have never read a self-help book before on the subject of how to achieve in life everything you want then this is definitely the only book you should read. Alan and Barbara have such a way with words that explains things so simplistically that you can really see how you can achieve lifes successes. I have read it through once to get a feel for the book and now I can't wait to put it all into practice. This is what I have been looking for....The Answer...to why I'm here in the first place. I'm still reading this book (and generally I would read a book a week..) So far I am really enjoying The Answer but it is starting to frustrate me that I haven't yet finished reading it. This is a really insightful book that had me hooked from the very beginning. The way the authors explain the workings of the brain is fascinating and the fact that they use science and studies to back up their theories has made me want to read on to get more answers. At this point in time I must say that since s I'm still reading this book (and generally I would read a book a week..) So far I am really enjoying The Answer but it is starting to frustrate me that I haven't yet finished reading it. This is a really insightful book that had me hooked from the very beginning. The way the authors explain the workings of the brain is fascinating and the fact that they use science and studies to back up their theories has made me want to read on to get more answers. At this point in time I must say that since starting this book I have felt like I have been provided with answers to questions I never asked but now feel like maybe I should have put more thought into previously. For example, when I purchased a new car it seemed that every other person on the road drove the same car as me and while i did wonder briefly why that was, i never seeked out an answer, i just accepted that it was just coincidence. The book explains the workings of our brain and why I was suddenly seeing more of this model car. This book requires commitment and work from the reader. What has slowed my reading is that at the end of each chapter you need to go away and do something (for example make a list of things you want to do/become). Without following the directions of the author i'm not sure that you could read on and get any benefit from the book. My issue is that because the book is so insightful and it is quite obvious how much research has gone into writing this book, I feel that my work is not enough. I have had to walk away from the book, sometimes for days at a time to really think about my answers. I have always been someone who thought they knew what they wanted in life and I was certain I knew how to get there and for things that I wanted but realistically didn't think I could achieve I just shelved them. This book has made me think back to things I have wanted in the past but decided were out of my reach and I have now added them to my list. While I don't know how they will be achieved I have not totally disregarded them. I guess this book has given me enough reasons (or answers) to believe that anything I write on my list is possible. I read this amazing book in 4 days. Set my goals, wrote by affirmations, and I'm on the path to achieve what I've always wanted. The book was a sensible, easily digestible, easy to apply, no nonsense book on how to achieve the things you want in life. It offers clear neurological details about how we are wired and how we can use this to our advantage. I know it will have a big impact in my life. I already feel like I've started my curvy path to success, which for me means a much clearer directio I read this amazing book in 4 days. Set my goals, wrote by affirmations, and I'm on the path to achieve what I've always wanted. I know it will have a big impact in my life. I already feel like I've started my curvy path to success, which for me means a much clearer direction than I have had in the past. Everyone is born with the fire in his/ her belly to achieve a successful life and self help books offer tasty and nutritious food in the form of tips and steps. The desire to improve myself always is so strong that I feel delight at the very sight of books belong to this genre.Once I become a binger to them. "THE ANSWER How to Take Charge of Your Life & Become the Person You Want To Be" gives us practical guidelines along with insightful perspectives to make us what we want to be. This book reigns supreme over the bestseller charts as it stands tall due to sharing of wit and the wisdom by Allan and Barbara Pease so as to enable us to achieve goals and realize our ambitions by reprogramming our mindset . The strong blurb of the book declares such an assurance and reading the book I feel enlightened. This is an accessible and practical guide that will help you take the first step and show you how to discover what you want from life, then make it happen. On the back side of the cover we can read the above sentence. The book holds all the motivational, inspiring and effective steps to find the purpose of life and lead a happy , peaceful and successful life. The title THE ANSWER itself speaks about the optimistic outlook as we have got several questions in our mind in respect of our sufferings, failures and setbacks and there is a wide gap between what we are to what we want to be.I find the core theme of the book is Goal setting . How to Take Charge of Your Life & Become the Person You Want to Be is the question and the book has got THE ANSWER. There are 16 chapters beginning with an introduction and ending with a reference page.They carry a captain each and I give below some of them. The book tells about the functioning of our brain and its influence on our behavior and hows to of altering it for achieving our goals . It carries the inspiring quotes from international acclaimed authors like Hunter S, Thompson Napoleon Hill , Thomas Edison Jim Carrey. and Sigmund Freud The true stories which give a clear picture and practical approach give hope to all of us.There are drawings diagrams and pictures to make the reader perceive the concepts.There are also summaries which help us to get the whole chapter in a nutshell . The book describes the secret of RAS (Reticular Activating System )Clearly defining goals , taking responsibility , the Art of visualization and other topics related to our development. The book is co authored by both of them it is written in the first person as Allan to make the reading easier. Flipping through the book makes me feel motivated and charged with the highest degree of intensity .It instigates me to introspect myself and come to a better self realization. The language of Allan and Babara Pease is direct , honest , and intelligent.They have highlighted important points . The narrative prose is excellent and it makes the reading a joyful and beneficial experience. The ideas are powerful and informative . There are so many advices given in bold letters which would open our eyes. Your RAS can either work for you or against you , it depends entirely on what you think about . Holding a grudge is like letting someone live rent-free in your head . The darkest room often holds the greatest treasure . The Authors stress some crucial points which would boost your confidence and happiness. 1. Handwriting your list is so important. 3. When you set your goal and create a plan with a deadline , take that first step and move forward -despite what others may think , say or do. There are alarming, but adventurous stories giving testimonial to the steps for improving our we can attitude . These stories relate to Robert, a teenager living in Europe who dreams of helping the underprivileged , Hank, who wants to climb Uluru as a goal and W.Mitchell aged 27 who met an accident leaving him burned 65 percent of his body. There are so many charts which would serve as a tool for monitoring your progress and many lists for hobbies etc for your ready reference and illustrative purpose . You can utilize them and follow up your goals.The pace is simply fast and you can have a comfortable read as the book is well organized.Cover design by Aaditya Rakheja is fantastic. I like the chapters Play the numbers Game and Overcoming Fear and Worry. The true story of the Authors Allan and Barbara Pease in which they described their goal to have two new healthy children and how they could achieve the same by proper planning and putting in sufficient efforts. Their poignant ordeals would melt our heart. ALLAN and BARBARA PEASE the internationally renowned best selling authors of The Definitive Book of Body language and Why men don't listen &Women can't Read Maps have crafted this book with meticulous research and punctilious to details and this best seller holds the nuggets of wisdom to make a great impact on your life . Their expertise coupled with hard work in writing successful relationship books has made this one a best seller as they have written a total of 16 best sellers, including 9 number ones and give seminars in 30 countries each year. Readers who are in search of the life changing mantra , would find this book a good lifetime companion as it proposes honest and effective steps to reach our goals. Bibliophiles would love this book for ornamenting their book shelves. All youngsters should read this book and refurbish their life to seize their goals refocusing on their strength instead of obstacles .Parents should recommend this book to their children . Teachers and students would find the book a boon for changing their lives. salah sangka, kirain bukunya kayak menjawab pertanyaanpertanyaan aneh macemmacem gitu, ternyata buku motivasi yang isinya lebih ke merancang tujuan hidup dengan baik dan benar. bagus untuk umur 20an, masamasa mencari apa yg ingin dicapai dalam hidup, sayang pengemasannya kurang menarik. I had no idea what to expect, and believe it did start off a bit slowly for my liking. I couldn’t quite get into the whole deal about the ‘RAS’. Shortly I was hooked and couldn’t put this book down. It certainly bought a whole lot of truths to the forefront of my mind and made me believe I was capable of changing the things I’ve been thinking about for some time now. I’ve got my lists on my fridge, bathroom mirror and work desk and it definitely helps me be more visual of my outcomes. I do find m I had no idea what to expect, and believe it did start off a bit slowly for my liking. I couldn’t quite get into the whole deal about the ‘RAS’. Shortly I was hooked and couldn’t put this book down. It certainly bought a whole lot of truths to the forefront of my mind and made me believe I was capable of changing the things I’ve been thinking about for some time now. I’ve got my lists on my fridge, bathroom mirror and work desk and it definitely helps me be more visual of my outcomes. I do find myself changing my negative thoughts and sentences into positive ones, which is slowly changing my mindset especially at work. A fascinating read and the repetition was surprisingly appreciated. Definitely reading this again once I get it back from my friends who desperately wanted to read it. I absolutely feel more motivated and look forward to my list items becoming a reality!! Thanks!! What an interesting and mind blowing book this is. There was so much that struck me, and that I wanted to read again and again. By page 75, I had my highlighter out to mark relevant passages, and then I needed my paper and pen to start making lists of what I want to happen in my life. My list is now 28 items long, but I keep adding to it. Now I just need to sort them into A, B & C lists. The Answer teaches that if you want it, you can steer your life to making it happen by writing it down. Sudde What an interesting and mind blowing book this is. The Answer teaches that if you want it, you can steer your life to making it happen by writing it down. Suddenly, as your brain is alerted to what you want, it brings to your attention little signs for you to make choices that will lead to your want becoming a reality. This has motivated me to action, to reassess the things that I thought I could never achieve. So, Why Not? Write it down, and let the (subconscious) brain find The Answer as to How to make it happen. This book is fabulous. I'm generally decidedly anti-self-help books, because I find them dull, and they normally just make me feel guilty about being unable to implement the bajillion things required to be "successful". In contrast The Answer gives you tidbits along the way and encourages you to take action - you don't have to read the entire book to start implementing it's advice and as you move through and are introduced to the concepts and they are slowly expanded upon then you can easily int This book is fabulous. I'm generally decidedly anti-self-help books, because I find them dull, and they normally just make me feel guilty about being unable to implement the bajillion things required to be "successful". In contrast The Answer gives you tidbits along the way and encourages you to take action - you don't have to read the entire book to start implementing it's advice and as you move through and are introduced to the concepts and they are slowly expanded upon then you can easily integrate them into your life. The Answer is more than a wishful thinking self help book. It outlines how the brain uses what we think and what we visualise to, in a way, direct us toward the life we want. It gives practical ideas to help reframe our thought processes. However, what we get out of this well written book depends entirely on whether or not we are willing to take its advice, and do the hard work that's often needed to change our life. This was one of the easiest self help books I have read. It gives ideas that anyone can use not only in your working life but your everyday life as well without your colleagues or friends knowing you may have read 'one of those books'. The power of the mind is fascinating and it describes how beneficial a positive attitude towards life can be. It certainly has changed some habits for me that I hope people around me including staff notice and appreciate. Couldn't finish this as it is really a repeat of their other books but with a little more brain anatomy. I went into this book thinking I would get to read more about the financial issues they had and how the overcame them. But instead got small snippets here and there. I enjoyed the pace and style of writing in this book. The pages are filled with humour, stories from Allan and Barbara's real life, combined with inspirational quotes and well-written advice. I found the organisation of the book to be easy to understand and straightforward. I feel that the content of this book will help me to achieve my life goals, and while I don't necessarily agree with everything in the book, I have several useful ideas and practices as a result of this book. If you're looking I enjoyed the pace and style of writing in this book. The pages are filled with humour, stories from Allan and Barbara's real life, combined with inspirational quotes and well-written advice. I found the organisation of the book to be easy to understand and straightforward. I feel that the content of this book will help me to achieve my life goals, and while I don't necessarily agree with everything in the book, I have several useful ideas and practices as a result of this book. I received “the answer” as a gift and remained on the shelf for 3 months, untouched, unopened. I don’t have any question and I don’t need answers. And it turned out completely different from what I had imagined. This book gives you a push, makes you believe in you and what you are capable of. Gives you hope to move on and go forward. Most importantly, helps you to have a vision and affirmation that when you want to do something, anything, you Can. It's amazing! I've never heard of the authors and then when I read this book I was like "Wow they are really really successful and I want to be like that" they inspire me to achieve my goals. And I followed its instructions and wow I will definitely re-read this. They went through a lot they are role models they should be known everywhere wow. I've read a lot of 'how to' books in my lifetime so it was refreshing to read a book encouraging me to focus on the 'what' I want to achieve and to only put emphasis on the 'how' later as the help starts to present itself. That is pretty much the premise of the whole book. The rest is mostly like a pep talk. One I enjoyed reading in only 2 days. Очень классный и подкреплённый научными фактами текст о визуализациях, аффирмациях и почему они работают. Про РАС до этого не слышала, но сразу стало понятно, почему «все вокруг беременные», когда ты сама беременная. Makes you realize how powerful the mind is. I think this book offers a clear understanding of an extraordinary combination between positive feelings, visualization and action-oriented goals. Filled with sensible humors and you got yourself a nice cushion for whenever you're feeling depressed. Worthy investment this book is. This is a great book, probably the best book I've read in years. In this book, the authors teach us how the brain works, then give answers to questions on how to take charge of your life and make it successful. “The Answer” explains it all; How to set defined goals, how to deal with stress, and how to overcome fear are just some of the questions that this book answers. In "The Answer", the authors constantly calls the reader to action, such as telling us to write our goals down onto paper, then This is a great book, probably the best book I've read in years. In this book, the authors teach us how the brain works, then give answers to questions on how to take charge of your life and make it successful. 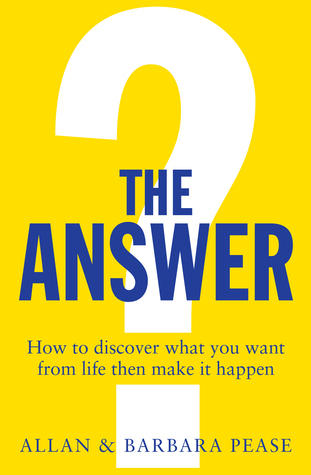 “The Answer” explains it all; How to set defined goals, how to deal with stress, and how to overcome fear are just some of the questions that this book answers. In "The Answer", the authors constantly calls the reader to action, such as telling us to write our goals down onto paper, then prioritizing them and rewrite them. Originally a musician, he became a successful life insurance salesman, he started a career as a speaker and trainer in sales and latterly in body language. This resulted in a popular sideline of aud Allan Pease is an Australian author and motivational speaker. Despite having no education in psychology, neuroscience, or psychiatry, he has managed to establish himself as an "expert on relationships".